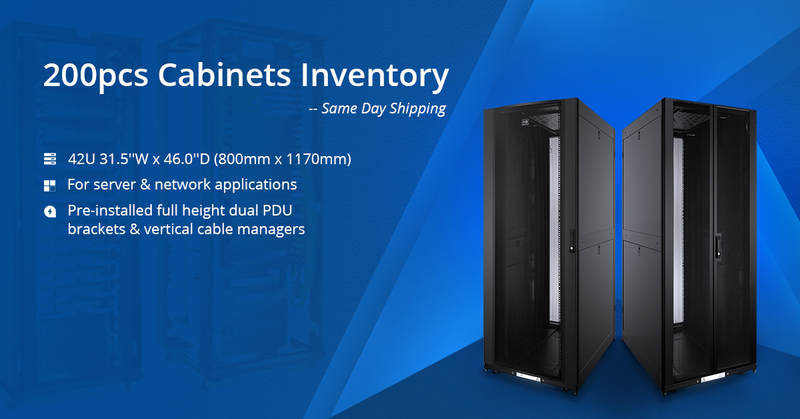 With the urgent needs of computing power and space in data centers, network cabinet or server cabinet is always chosen as an ideal solution for enterprises from telecommunication industry. But one product alone can not fulfill the demands of all, so it’s necessary to find one that can perform both sides. At FS.COM, we succeed in finding 42U network & server cabinet, which provides the best performance. In this article, we will give an all-round introduction to FS 42U network & server cabinet. What Is 42U Network & Server Cabinet? 42U network & server cabinet, as the name implies, is a multifunctional device. It can be both used as 42U network cabinet and 42U server cabinet. One part as the network cabinet, it is commonly used to house routers, network switches, patch panels and other similar networking equipment. Another part as the server cabinet, it’s applied to server installations, house UPSes and monitors as well as other similar equipment. So FS 42U network & server cabinet combines the advantages of both. 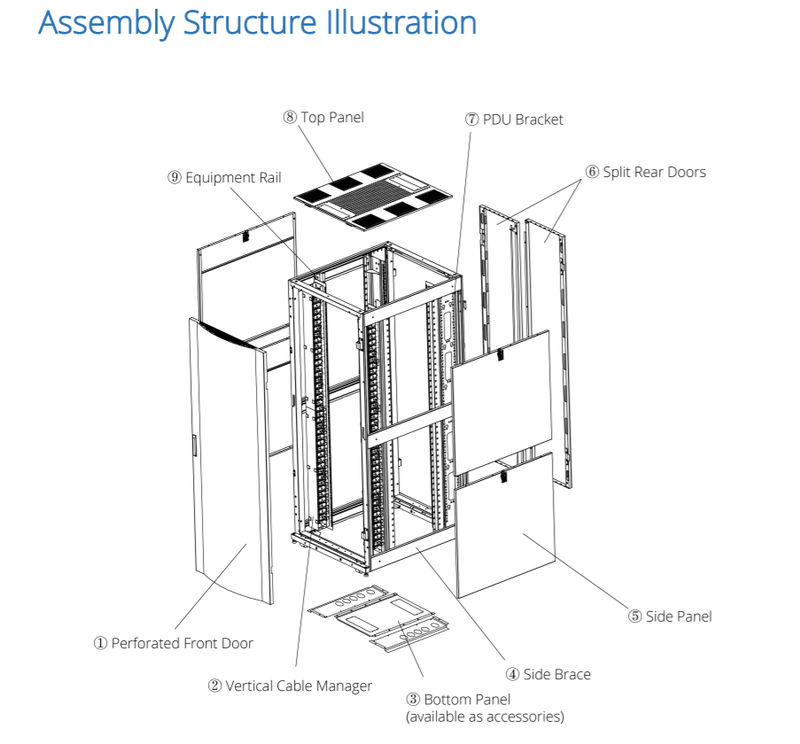 It’s a distinctive, robust cabinet solution that supports and protects rack-mount servers, storage and network equipment in multi-tenant and enterprise data centers, computer rooms and network facilities. Perforated doors: provide massive ventilation for servers and networking equipment. Removable hinge system: hinge pins allow easy removal during maintenance. Top panel: six brush-covered cable openings in the top panel provide easy access for overhead cabling. Grounding system: utilize quick-release ground wires that detach from the front and rear doors. Equipment support: can be adjusted in half-inch (12.5mm) increments. Side panels: locking removable side panels keyed alike with doors. PDU brackets: allow for easy integration of rack PDUs and cable managers. Vertical cable managers: allow for easy organization and location of large cable bundles. Casters & Leveling feet: casters & levelers are removable. It has adjustable depth mounting rails that support a wide range of equipment, even up to 1500kg (3307 lb) of equipment. Cable and power management accessories create separate pathways for cables. Server cabinet is able to provide a variety of air segregation strategies, such as cold aisle containment, hot aisle containment, cabinet-level containment. The top panel is designed to maintain proper hot aisle or cold aisle flow. The split side panels are locking removable with half height. Thus, the size and weight can be both reduced for an easier operation and access to equipment. The innovative frame design maximizes RU utilization. Each configuration accelerates deployment and promotes rapid upgrades without reconfiguration and downtime. The cabinet can be locked, which might avoid visitors or other unauthorized people accessing the equipment. With doors and side panels, the cables in the cabinet has much less access to outside air. So it helps to reduce the risk of getting damaged by contaminants. From the above highlights, we can know that FS 42U network & server cabinet is beyond our expectation for combing both advantages of network cabinet and server cabinet. It simplifies rack equipment installations and rack equipment maintenance, serves as the ideal solution for secure, high-density server and networking applications in IT environments. It is also compliant with lots of standards such as, ANSI/EIA RS-310-D, IEC297-2, DIN 41491; PART1, DIN41494; PART 7, GB/T3047.2-92, ETSI Standard. Data, security, audio visual and telecommunication areas, you will find FS 42U network & server cabinet covers a wide range of applications. If you need one, you can contact us at FS.COM. Our business radiates globally, we are sure your demands can be satisfied. This entry was posted in Cable Management and tagged 42U Network & Server Cabinet on November 13, 2018 by Admin.